An entry of 1,220 sheep at Markethill on Wednesday, July 25th sold in an noticeably firmer trade with prices for fat lambs increased by £5 to £8 per head on the week. Good quality mid weight lambs sold to a top of 400p for 22kg £88 for a Kilkeel farmer, followed by 396p for 23kg at £91 for an Armagh farmer. All top quality pens sold for 375p-394p per kg with the entire enter of midweight lambs averaging 22kg at £84 (381). Heavy lambs sold to a top of £97 with several more pens from £92 to £96.50. 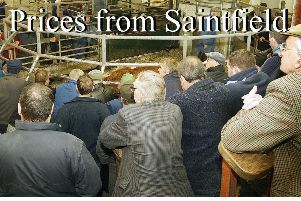 Top price 388p/kg for 25kg at £97 from a Kilkeel farmer followed by 384p 24.5kg at £94 for Loughgall producer. Over 250 cull ewes sold in a noticeably stronger trade. Top quality ewes sold for £80-£119 and second quality from £60-£70 each. The first sale of breeding hoggets returned good demand for god quality hoggets although plainer sheep were harder to clear. Top price £188 with several more pens from £150 to £180. Store lambs: Mayobridge farmer 11.9kg, £50, 420p; Hilltown farmer 18kg, £69, 383p; Lislea farmer 16.2kg, £62, 383p; Dromore farmer 13.4kg, £51, 381p; Ballymartin farmer 19.7kg, £74, 376p; Birches farmer 16kg, £59.5, 372p; Rostrevor 18.7k, £68.5, 366p and Coagh farmer 12.7kg, £46.50, 366p. Middleweight lambs: Armagh farmer 22kg, £88, 400p; Armagh farmer 23kg, £91, 396p; Glenanne farmer 23.2kg, £91.50, 394p; Markethill farmer 23.2kg, £91.50, 394p; Tandragee farmer 21.7kg, £85.50, 394p; Portadown farmer 21k, £82.50, 392p; Banbridge farmer 20.5kg, £80, 390p; Glenanne farmer 23.2kg, £90.50, 390p and Richhill farmer 23.4kg, £91, 389p. Heavy lambs: Kilkeel farmer 25kg, £97, 388p; Armagh farmer 24.5kg, £94, 383p; Collone farmer 24.4kg, £93, 381p; Dungannon farmer 25kg, £95, 380p; Cullyhanna farmer 24kg, £90, 375p; Portadown farmer 25.6kg, £95.50, 373p and Dungannon farmer 24.7kg, £92, 372p.